When I have extra fabric pieces that are not quite large enough for a full project, I toss them into the scrap basket for another day. Well, today is that day! I’m going to turn most of them into scrap binding. This binding can be used for many things from a quilt, mug rug to piping. For me, I love the way the different patterns come together and play off each other. To get things started, I need to press my scraps. Then it’s time to start cutting. I like create my binding into uniform 3″ wide strips. This makes things easy to remember. Open your seams and press. Repeat until you enough binding to complete your project. Not sure how much binding you need? Click here to learn how to calculate basic bias. Fold strip in half, press and attached to your project. 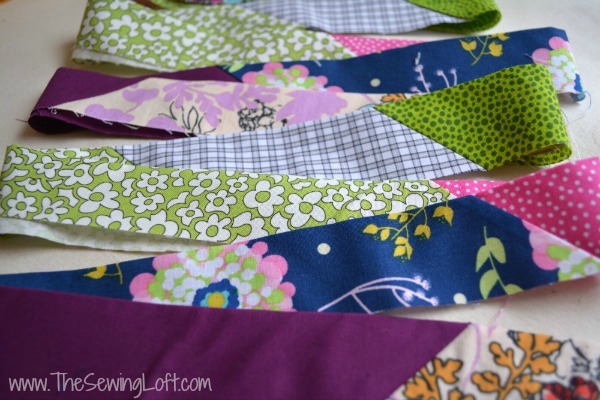 Now that you have your scrap fabric strips stitched together it’s time to think about what to make. My scrap binding found a home on a new sewing mat. You can find the tutorial here. 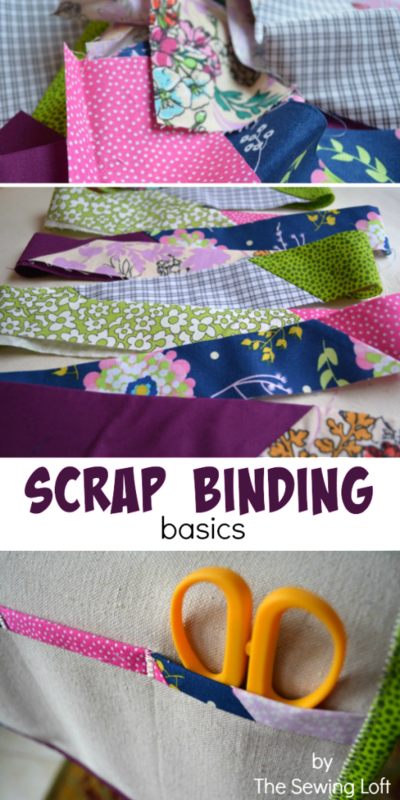 What would you make with scrap binding? Resourcefully great idea!!! I think I’ll do the same!!! I make scrap binding and use on scrappy quilts for charity but also like it on scrappy quilts I keep. I keep a drawer of binding ready to use. The very best idea I have heard in a long time. Keep up the great work. I use scrap binding frequently and love the way it looks but I have always used the scraps from what I was binding. I never thought to go to my scraps stash, join them together randomly and then decide what to use them on. I like your way of thinking! Thanks Anne. I’m a very “use whatcha got” kinda girl! Plus, my scrap stash is out of control right now and I need to thin it down. I’m hoping to piece together a few charity quilts this year and this binding will be perfect. Should the strips be cut on the bias? Binding can be made either on the straight or bias. Bias is best for any curves or sharp angles. I plan on using this for rectangular quilts & projects so straight grain will work well. Great idea! I don’t thow any fabric away, it just doesn’t feel right…! I, too, have a canvas mat under my machine. The binding you did is so much cuter than my simply hemmed one. I shall discard my old cute-less mat and make myself a new one full of cute-ness! I think I will need two rows of pockets, though. I keep a lot in mine. Two rows of pockets would be nice. Next time, I would make one to slip my business cards in. This baby will be traveling with me to different events. Can’t wait to see how yours turns out. I was on the fence about what size to do it in Judy. So, I went bigger. I thought I could always cut it down later. I’m really loving have it put together and ready for my next project. Thanks for the great idea! Do you know when your mat tutorial will be out?? I love it! What a great idea! I have a drawer full of scraps that would be wonderful for scap binding. Love this idea. Do the scraps have to be cut on the bias? Binding can be on either the straight or bias. I cut my strips on the straight grain and then pieced them so that they appear to be on the bias. I know it’s kinda cheating but I like the way it looks. I made some of this to finish off the sewing machine mat. Now I’m addicted! Winding it on to a card to keep it nice….looking forward to making loads of things. I love the way what it is joined, the colours sort of fade in and then out! Love it!! YAY!! That’s fantastic Sally. I’m so glad to hear that you were inspired to start stitching. I LOVE this idea, but I’m a little confused. 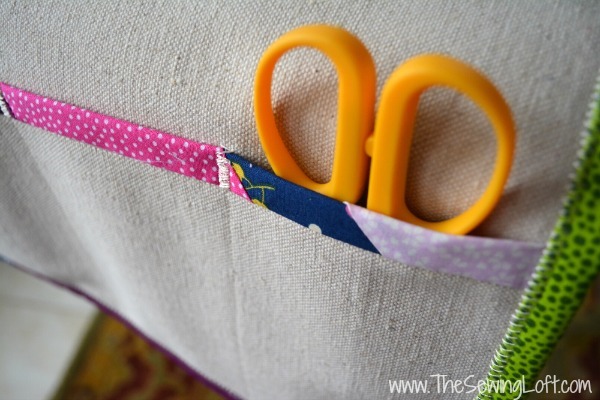 You Said to fold the bias tape in 1/2 & sew. I always thought it is ironed in 3 folds. If you’re only folding in half, how are you applying it to your project? Yes, that is a great question. 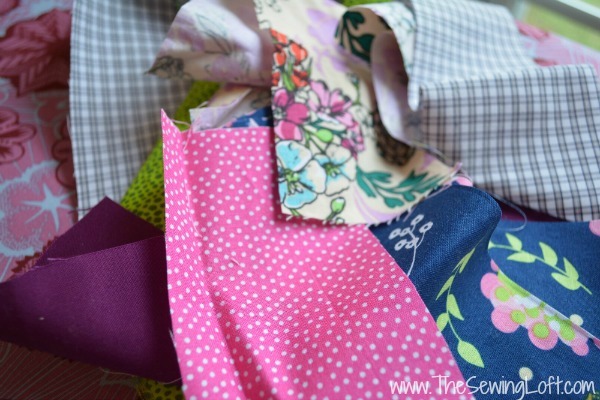 Bias tape is folded into 3rds but this tutorial is for binding. You can use the same method and just fold/iron it differently to create bias tape. 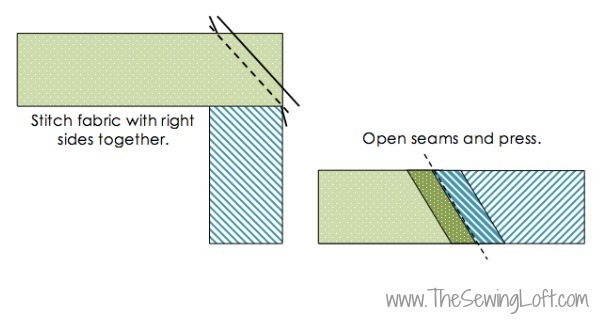 I hope that helps and think that a skirt or dress would look fantastic trimmed with scrappy bias binding! Love it! 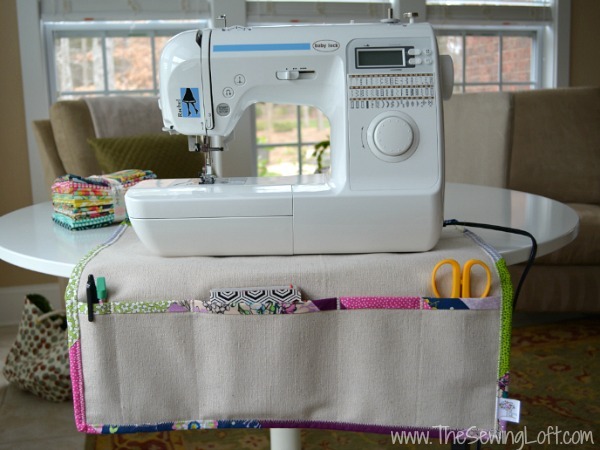 Both the binding and the sewing mat! I need you to fill in the blanks for me. I am new to SCRAPPY BINDING. Please tell me what width and length the strips are. If they are 3″ long, then they are not that wide. I need the measurements for this. I have been saving so many scrappy pieces. Thanks! Thanks for your note Lacey. You can make them any length and width. It all depends on the size of the scrap you have left over in your stash. Love this! Got the 3″ width part. What about the length? All the same or varying? Thanks! So glad you like it Cate. I made them all different lengths based on what I had. There was no real formula. Be sure to tag me when you finish. I’d love to see! When cutting the 3″ strips do you cut on the bias or with the grain. Does it matter? Scrappy binding can be cut on the bias or straight grain. It really depends on the end use. If the binding will be used along a curved edge it is best to cut on the bias. However, it will be used for a straight edge of a quilt, you can cut it on straight grain. Hope that helps!